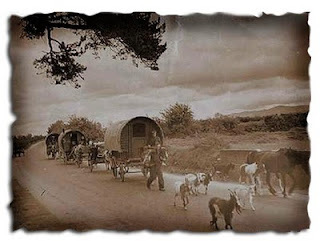 My discussion below of George Borrow’s links with the gypsies leads me to reflect on the appearance of gypsies in literature. In Borrow’s time references were not uncommon. I think, for instance, of Matthew Arnold’s ‘Scholar Gypsy’ who “went to learn the gyspy lore” but “came to Oxford and his friends no more”, or George Eliot’s The Mill on the Floss in which the child Maggie Tulliver runs off to join the gypsies and is brought back by one of them (minus a silver thimble) in expectation of a reward. The dominant themes during this period contain both a romantic sense of a mysterious people emanating strangeness and a sense of outcasts living on the edge of – if not beyond – ordinary human life. Walter Scott reports that they were regarded in Scotland as possessing similar powers to the fairies. But at the same time anthropologists were linking them not to Egypt – as had been thought - but to India and finding analogies between the Romany language and Sanskrit. Nevertheless they remained mysterious: Fortune tellers, horse-whisperers, travellers on the green roads able to melt into the countryside at will. As such they inhabit a different space in the ethos of the life on the land than, say, other groups of travellers, tinkers, disenfranchised groups wandering homeless across the country. But at the same time not. Such are the contradictions of our attitude to otherness. In our own day we hear of France expelling Romany back to Romania. This is not new. An edict of Elizabeth I ordered them to leave the country under pain of death, but it was said at the time that if one were executed they would divide into many more.